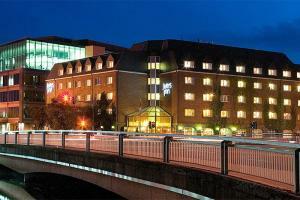 Jurys Inn Cork is ideally located just minutes from shopping centers, the Cork train station, and the Cork Opera House. The hotel sits beside the River Lee and is surrounded by plenty of bars, restaurants and cafes. This hotel offers 133 spacious rooms that are perfectly designed for comfort, where guests can relax after a day of exploring all the city has to offer. Situated right by the river Lee and surrounded by restaurants, museums, galleries and bars on Anderson’s Quay in Cork. Fota Wildlife Park, Ocean Escapes, Cork Sea Safari, Everyman Theatre, Cork Opera House, The English Market, Crawford Art Gallery, Cork City Gaol.